Andrew Midgen practices in the area of labor and employment. Prior to joining Pitta LLP as an associate, Mr. Midgen worked for CSEA/SEIU Local 2001, where he represented public sector employees in collective bargaining, arbitration, mediation and state labor board proceedings. During law school, Mr. Midgen held internships with the NLRB Division of Judges, the U.S. Department of Labor Solicitor's Office, and UNITE HERE! Local 100. 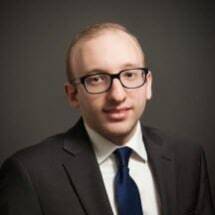 Additionally, his article titled “The Future Scope of the Antitrust Exemption in Professional Sports” won first place in the New York State Bar Association’s 2012 Dr. Emmanuel Stein and Kenneth D. Stein Memorial Writing Competition. Mr. Midgen received his Juris Doctor from St. John's University School of Law in 2013. He received his Bachelor of Science with honors from the Isenberg School of Management at the University of Massachusetts Amherst in 2010. Mr. Midgen is a member of the Bar of the State of New York, New Jersey and Connecticut.